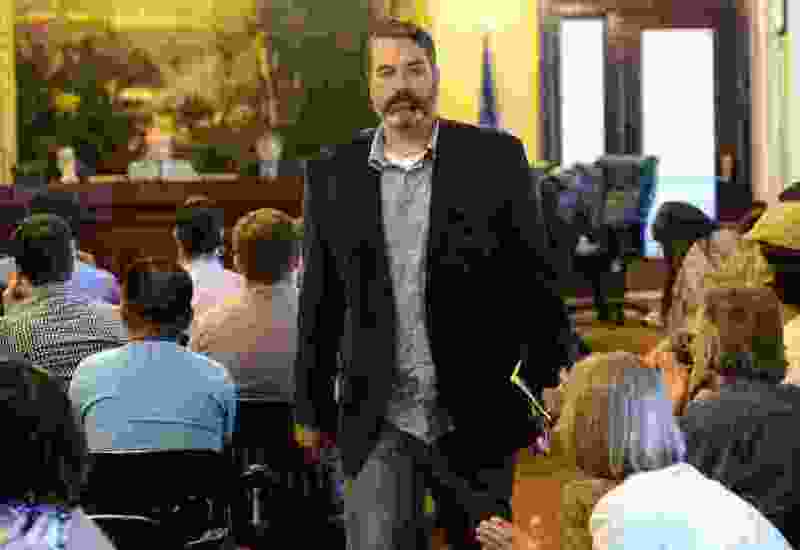 (Tribune file photo) Democratic Party Chairman candidate Rob Miller walks out of a town hall at the State Capitol in Salt Lake City Wednesday June 7, 2017. after a meeting for the candidates after audience members protested him following multiple allegations of sexual harassment. The Utah Democratic Party recently adopted changes to its anti-harassment policy that look to address some of the “loopholes” that made it unclear whether the party could investigate Miller. About 18 months after a prominent candidate for chairman of the Utah Democratic Party was accused by multiple women of sexual harassment, the party has adopted a new anti-harassment policy that seeks to address some of the “loopholes” in the old one. Shortly after Rob Miller, the party’s former vice chairman and treasurer, was accused by seven female Democratic activists of multiple incidents of sexual misconduct in June 2017, he dropped out of the race and left the party. Under the former policy, it was unclear whether the party could still subject him to an investigation. But the amendments — approved at the party’s State Central Committee meeting on Dec. 19 — clarify that anyone who has voluntarily resigned a position with the state or any county Democratic Party in Utah after a complaint has been filed and before it has been resolved can still be investigated. Someone doesn’t have to be a registered Democrat to attend party events or become a delegate or member of the central committee. So it makes sense, Mahallati said, that it’s not only registered Democrats who are subject to the party’s anti-harassment rules. Other policy changes more clearly define the roles and responsibilities of the party in investigating allegations of sexual harassment and outline standards for communication among the involved parties, said Mahallati, the chief legal counsel for the Salt Lake County Democratic Party. Daisy Thomas, chairwoman of the Utah Democratic Party, said the policy updates reflect the party’s commitment to creating an inclusive party in which everyone is treated with respect. The allegations against Miller, outlined in a letter sent to former state Democratic Party Chairman Peter Corroon just weeks before the election for party chairmanship, alleged he had kissed and hugged women without consent, stroked their hair without permission, pulled down his pants to show Mormon undergarments and turned one supposed job interview into a request to date him. After the letter became public, two male Democratic activists joined the seven women to say they had also witnessed inappropriate behavior by Miller. Miller denied all the allegations and said they were a false, last-minute political attack by women who wanted to elect a female boss at the Democratic State Convention. The women contended their experiences revealed a “culture of pervasive sexual harassment” and called for the party to determine the failures and flaws in its reporting system. “The statement was made, you know, we’re not going to [address the alleged harassment] because he’s no longer a member of the party,” said Sheryl Ginsburg, one of the seven women who’d made allegations against Miller. That conclusion, she said, “left us all feeling ignored and invisible." Thomas said she was unable to comment on whether the investigation into Miller had closed or was ongoing, citing the commitment in the anti-harassment policy to protect the privacy of both complainants and the accused. In addition to the policy changes, the central committee also approved at its Dec. 19 meeting six recommendations related to sexual harassment that came from an ad hoc Harassment Task Force formed in October. The recommendations ask the party to hold a formal training process for all delegates and central committee members, as well as a separate, formal training for paid staff and executive committee members. Per those suggestions, the task force also will be reorganized to include county party officers who can examine streamlining the policy further. The party is accepting comment on the changes, Thomas said, and will host a public hearing on the task force on Thursday at the Utah Democratic Party Headquarters. Afterward, Thomas and task force member Rep. Angela Romero, D-Salt Lake City, will hold an open to the public sexual harassment training, which will be facilitated by the Utah Department of Labor. “We’re going to keep working towards creating a better policy because it’s not just about making sure we have the right document in place ― it’s about creating the [right] culture,” Thomas said.